This month NewBeauty revamped their TestTube with a whole new look and a whole lot more to love. There are so many products this month! 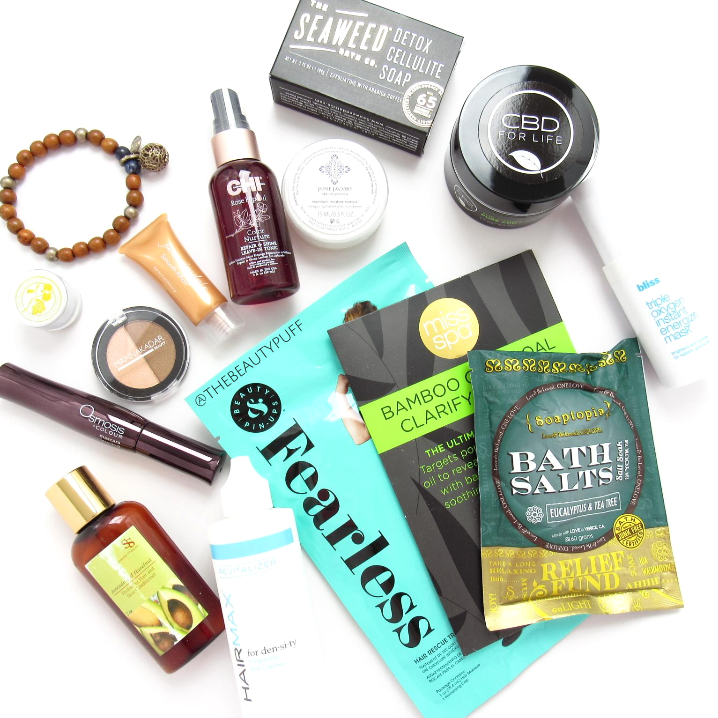 So grab a drink and let's dig in to this month's NewBeauty TestTube 2.0 - beauty problem solvers! Bliss Triple Oxygen Instant Energizing Foaming Mask | Sample, full size 3.4 oz $56 | A nourishing mask that foams in 5 minutes. It protects with Grapeseed extract, hydrates with Vitamin C and E and brightens with antioxidants for a beautiful glow. The Seaweed Bath Co Detox Cellulite Soap | $8 | Packed with vitamins and minerals, this soap exfoliates to help reduce the appearance of cellulite and benefit skin. Arabica coffee works to stimulate circulation and collagen production so you'll see smoother skin with every use. June Jacobs Mandarin Moisture Masque | Sample, full size 4 fl oz $52 | A hydrating and repairing mask packed with hyaluronic acid and mandarin orange extract. It's a great multi-tasker that keeps skin hydrated, reduces puffiness, and improves skin's natural healing abilities. Soaptopia Bath Salts | $3 | There's nothing like a soothing bath after a long day! These bath salts have calming Eucalyptus and Tea Tree Oil that provides anti-viral and anti-bacteria properties. Miss Spa Bamboo Charcoal Clarifying Mask | $8 | I have oily skin so I'm all about clarifying masks. This sheet mask has bamboo charcoal extract that gets dirt out of pores for clearer skin. It also has Vitamin B3 which evens tone to brighten your complexion. Pure CBD Face Cream | $35 | TestTube subscribers received one of three CBD products this month. I received the face cream which I'm really excited to use this winter. It contains antioxidants, Vitamins A, D and E, and natural essential oils. I love being introduced to more natural skincare brands! Chi Rose Hip Oil Leave-In Tonic | $6.30 | Quench your hair's thirst with this tonic that helps repair and add shine to your locks, just in time for winter! It provides heat protection, frizz control and longer lasting color by sealing the hair cuticle. Key ingredients include rose hip oil and Vitamin C.
Sonoran Hair and Skin Conditioner | Sample, full size $15 | This conditioner can be used on the skin or the hair. I'm more likely to use it on my hair but I love the concept. Key ingredients include avocado oil and mango butter. Beauty & Pin-Ups Fearless Hair Rescue Treatment | $10 | A hair mask that seals cuticles, tames frizz and keeps your hair heathy and hydrated. You can even throw this one-time-use treatment in your bag for holiday travel to revive hair on-the-go! The key ingredient in this mask is castor oil which helps to seal cuticles and gives hair a more voluminous look. HairMax Density Revitalizer | $18 | I can't wait to use this treatment - all it takes is one minute in the shower. With the help of peppermint oil and menthol, this revitalizer helps reduce dry skin on your scalp and supports circulation to help hair growth. Manna Kadar Bronzer + Highlighter Duo | Sample, Full size $21 | I have a couple of these duos and I love the pigmentation. They're really versatile and you can use them as eyeshadows as well. There's no fallout and they're super smooth. I love everything I've tried from this brand and I'd love to see more products featured! Lisa Hoffman Fragrance Bracelet | $85 *Bonus | This bonus item is a bracelet that can be filled with small fragrance beads. It's a unique way to wear a fragrance with no worry of skin irritation. There are a lot of different designs on the website so you can get one to match your personal style. Jane Iredale Primer | Sample, Full Size $48 | A great pick for those looking to clean up their beauty routine. This multi-tasker primes, nourishes and hydrates the skin with grapefruit and apple extract. I love that it mattifies without dulling the skin. A great product for my oily skin this winter! Osmosis Colour Curling Mascara | $25 | I've tried several Osmosis Colour products, but not their curling mascara. I'm always up for trying new mascaras and I love the benefit of a curling formula. This mascara also has Pro-vitamin B5 for moisture and volume as well as beeswax for holding a curl and adding water-resistance. The NewBeauty TestTube 2.0 features 10+ products and ships every other month. Each tube is $29.95 + shipping and includes a subscription to NewBeauty magazine. Save on your first tube with the link below!